Island Blue offers Architects, Engineers, Building Designers and Contractors superior quality black & white digital bond prints from digital files of building drawings and plans. Printed on 30% post consumer recycled white bond paper through production printers capable of printing over 1200 “D” size drawings per hour, we also offer 100% post consumer recycled white paper available on request. To keep track of any drawing changes throughout a project, addendums can be printed on tinted bonds in blue, green and yellow. From hand drawn originals, tracing vellums or old blueline/blackline prints, the material is scanned and printed. For convenience in the office or on the job site, drawings can be printed at half size for easier handling. We now stock Duracopy, the wet weather solution, for your construction site needs. With superior weather resistance and tear resistant material, printing your schematics to Duracopyis the clear choice. Not a problem! 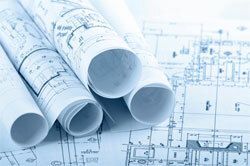 We offer quick turnaround of full colour printing on building plans, maps and building renderings. Architects, Engineers and contractors can now introduce full colour into their presentation drawings or bid sets at a competitive price. As-built drawings with colour markings can even be scanned for archive or additional sets printed as required. Cartographers, Utility Companies, Manufacturers and Government Agencies requiring full colour maps, production schedules or large format presentation materials can order copies quickly and inexpensively. We're also available to handle distribution of your bid drawings and specifications for any type of project, big or small. This includes wrapping, labelling and delivery through local and out-of-town couriers.